"This has got to be one of my favorite creations. 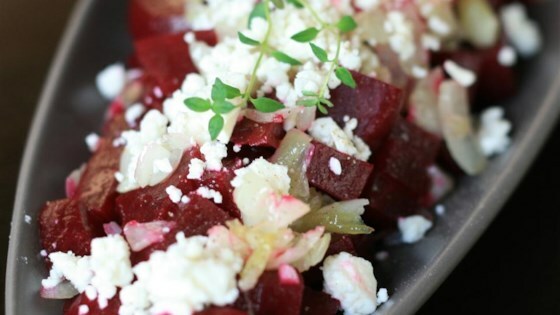 It's a simple beet salad with the wonderful taste of garlic and onion and Feta cheese crumbles. I served this to a group of 20 and 19 of them wanted the recipe. " Heat the olive oil in a skillet over medium heat; cook and stir the garlic and onion in the oil until translucent; scrape the mixture onto a plate, and place in the refrigerator to cooled to room temperature. Once cooled, stir the feta cheese into the garlic and onion mixture. Arrange the beets on a serving plate; top with garlic, onion, and feta cheese mixture; season with salt and pepper. I make this about once a week now. It is absolutely delicious. I do not cook the onions, I thin slice some of one raw. Getting a bit of everything in one bite is heaven. I made this and was a little disappointed. It was okay but not great. I don't think that I will make this again. I have made this recipie several times. It tastes great, but I would recommnd leaving a little of the beet juice in the mixture because it gets a little dry.